This ride begins only a couple short miles from my house. 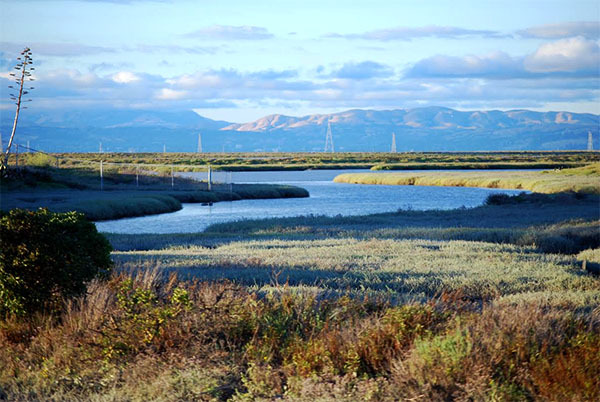 As soon as I hit the highway I can look to my left and see marshlands, the San Francisco Bay, and mountains beyond. If that wasn’t enough, the view changes from day to day, from whiffs of fog rising over the marsh to bright sunshine making the scene sparkle. Some days the tide is high and I see a lot of water and other days the tide is so low there is hardly any water to be seen. There is a small harbor across the marsh where Redwood Creek enters the Bay. Today I see a bright orange and red ship at port. This is a new one, mostly older freighters dock there. They are all bulk cargo vessels. There is also a concrete mixing business over there, leading me to believe many of the ships bring in cement. Just a couple more miles along the highway there are eucalyptus trees lining the road. It is old – fashioned, sure, but just like the old days they bring a hint of the country to me as I ride along. The next vista is a different Bay view. Different marsh but the same Bay and mountains. The mountains are a few miles closer here. In the winter there can be snow at the top of the range and that really does make for a pleasant change. Here in California, the mountains are bright green in the winter and golden brown in the summer. Mount Hamilton is the highest peak in this range. A few times a year I can watch the sun rise just over the top of it. The observatory buildings at the top glisten in the first light of dawn. They are thirty or so miles away but seem to be just ahead on the highway. On really clear days Mount Diablo is more than an outline fifty miles distant. You can make out the tree line and almost see the trails. They say the view from the top is the biggest view in the world second only to Kilimanjaro in Africa. You can see Shasta in far northern California and Whitney far south in the Sierras. One sight I look forward to is San Francisco on one of the clear days. SF is about thirty miles across the water. But on the best days you swear you can count the windows on the tall buildings and almost see people inside of them. I can ride near history too with Fairchild Drive running parallel to the highway around Moffett Field. Before we had Silicon Valley, the pioneers of chip making were making transistors here. So what is this highway? It is US 101, the Bayshore Freeway. Yes, a four lane freeway I ride to work and back on almost every week day of the year. I enjoy a curvy road in the mountains as much as the next guy. And I feel lucky to enjoy my commute a lot more than him as well.